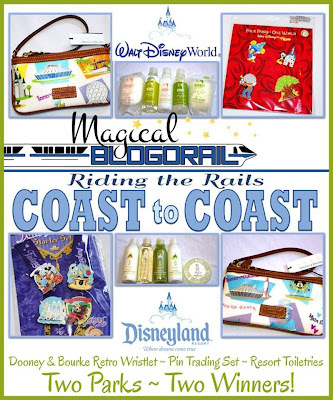 Magical Blogorail Riding the Rails Coast to Coast Giveaway! | Focused on the Magic : Magical Blogorail Riding the Rails Coast to Coast Giveaway! I am super excited today to announce a mega magical giveaway! Members of the Magical Blogorail have teamed up to bring you a Coast-to-Coast Giveaway that includes fantastic prizes brought back from the Walt Disney World Resort in Florida and Disneyland Resort in California. Two Parks ~ Two Winners! There will be 2 randomly drawn and verified winners of this giveaway. Giveaway begins September 16th and runs through September 26th at 11:59pm US Eastern time. It is open to residents of the US only, 18+. Use the PromoSimple form below to enter, and be sure to take advantage of the many entries you can gain. Come back daily for even more chances to win.